You may receive a PDF from someone or download a PDF file from the web. When the PDF is opened, it turns out to be upside-down. It goes without saying that such a PDF is very difficult to read. Fortunately, with the aid of some software program, you can rotate PDF pages to the right direction. Although you can make use of Adobe Acrobat to change PDF orientation, the condition is that you shell out $12.99 per month. Obviously, everyone is more willing to use a free tool. So, today, I want to introduce a great PDF tool-PDFConvertFree to help you rotate PDF without costing you a time. Just continue reading this article. PDFConvertFree is a very straightforward and easy-to-use web-based application to handle the PDF rotating job. Let’s walk through the key features of PDFConvertFree as below. 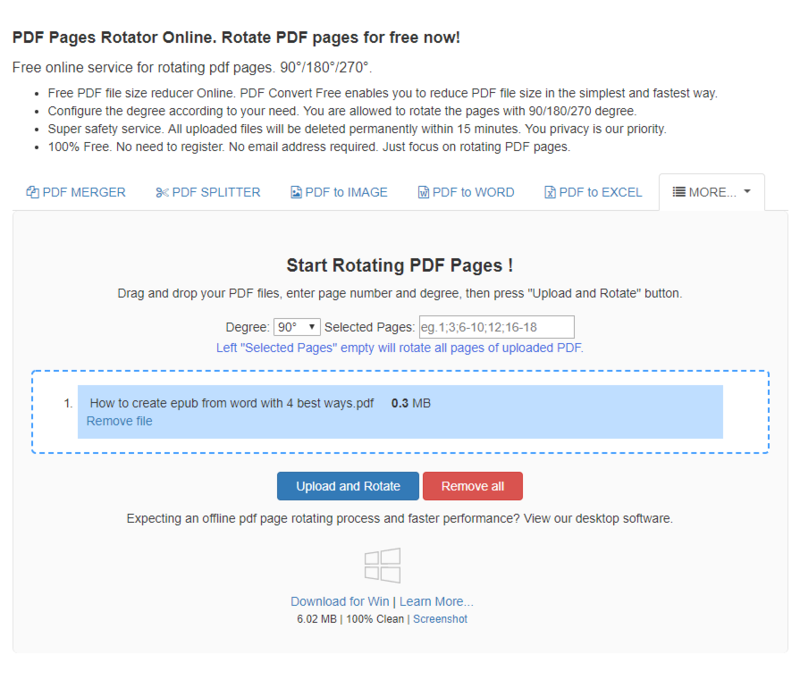 PDFConvertFree gives you the possibility to rotate all PDF pages or some of them. PDFConvertFree allows you to rotate PDF page 90 degrees clockwise, 180 degrees flip or 90 degrees counterclockwise. You may come across some online PDF page rotators that force you to cough up bucks to lift usage restrictions. Unlike them, PDFConvertFree is a truly free service that has no hidden charges. You don’t have to worry about your data security because all your files uploaded to the server will be entirely erased from the server within 15 minutes. You are not asked for creating an account or submitting an email address to receive the download link. The following info is about how to rotate a PDF document using PDFConvertFree. Add the PDF to the web interface via the file browser. Or drag and drop the file directly onto the drop zone. Choose the direction you want the PDF page to be rotated from the drop-down menu. To rotate the entire PDF, leave the “Selected Pages” empty. To rotate specific pages, use semicolon and hyphen to specify the page range like “1;3; 5-6”. If you want to remove the added item, just hit the “Remove file” button. When you are ready, click on “Upload and Rotate”. The PDF will be uploaded to the server and then rotated as desired. You can expect a fast process that finishes in seconds. When it is done, click on the download link to save the rotated PDF to local. Creating PDF from LaTeX, EPUB, image, Word. Converting PDF to PPTX, TXT, Word, EPUB, SVG, Excel, image. Convert Word, EXCEL, EPUB, TXT, PPT, JPG to PDF. Turning RGB PDF to grayscale. Encrypting PDF with user password. Merging a bunch of PDFs into one file. Splitting a PDF into multiple files.